18 Need for a page. 21 Should we move this? I was a fan of the first game years ago because of the concept of artifical life with semi-realistic dna interactions and the like- but I never played any of the later games, they any good in comparison? I can imagine the game creators giving in to less interesting ideas to please the masses, youkno, the way a band's first album is always the best. Kthx. Right now I'm creating an entry for Vocabulary and I'd like to put it in a category named Vocabulary. (I'd like it to be a subcategory of Internals) I'd then like to make subcategories on the words for each game. There would be All Games, words introduced in C1 and used in subsequent games, and each game would get its own section for words were used in that game but not all. (Like how "eat" was not used in C1 but it was in the other games.) Then each game would be divided into the kinds of words, noun, verb, adjective. Some of these terms have been entered already. (Of particular note, "push" and "sleep.") The problem is, they're in a category with a different title. (Actions) I would like to implement my idea of categorizing the vocabulary but I'm unable to move/rename categories. Thank you for pointing out the categories already in place. I will try to adapt what I've been thinking of to work with what's already here. > What would the Vocabulary category contain? If you don't mind me rambling on about it, I'll explain. First of all, I must say I think categories aren't exactly the best thing to use - their design is quite bad, list articles are much better IMO. I agree that lists are often useful, but why do you think they would be better, and for what particular purpose? The benefit of categories are that they effecively self-updating. The benefit of lists is that they can say more. Both may have a place here. In the (most probable) case we keep the categories, we should add one category for each game for official breeds. And another thing, the 'Official Ecology' category seems more like a 'C3/DS Official Ecology' thing, so do we change the category name or include in it all the official ecology articles from the other games? I think it was C3 because Gryph had C3. It could go either way. You could make subcategories for each game, say. Third: In the wiki, there is no clear definition between what is official and what isn't, and frequently categories group indiscriminately official with third party. and although I love many of the agents/cobs and breeds that were third-party developed, there MUST be clear delineation between those two grounds. 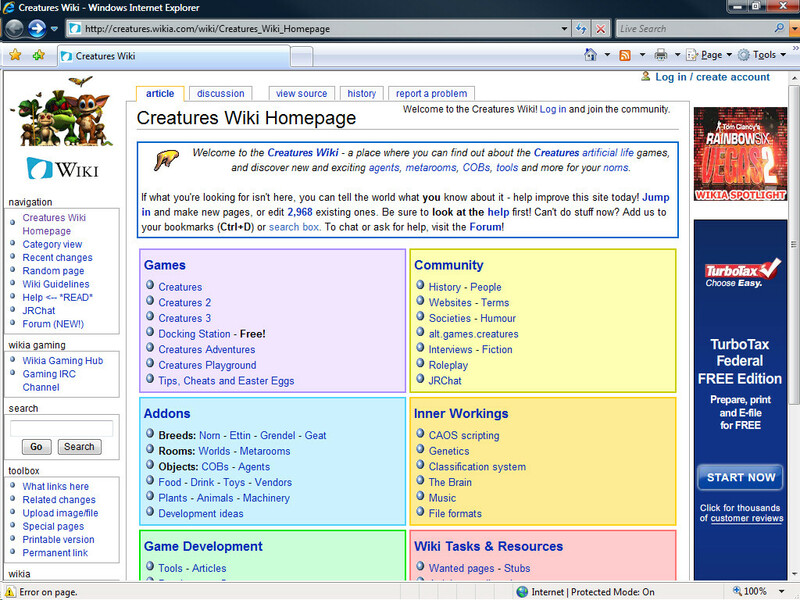 Fourth: The creatures wiki should be more supportive of BamZooki. I know it is a 'Creatures' wiki, but what is 'Creatures'? Only the titles with 'Creatures' in their name? No! 'Creatures' is (or should be) a title given to all A-Life experiments made by Cyberlife/Creature Labs/Gameware. Sea Monkeys would enter this category. And so would Yeren (Beasts). Creatures experimented with A-Life genetics, behavior and ecology. BamZooki experiments with A-Life locomotion and physics, and quite frankly, I see BamZooki as some kind of spin-off of Creatures, just like Sea Monkeys and Yeren were. It is not the 'main' 'Creatures' series, but it is still part of the whole of 'Creatures'. We have articles about all the games CL/GW made, but that doesn't mean we have detailed articles on them all. Many of them were less than notable. None of them developed anywhere near the fan base. BAMZOOKi is, of course, closer to the topic than many of those, and also rather popular now. Perhaps it should be covered more. But when you say "supportive", what do you intend for us to do? We all know about Creatures, not BAMZOOKi. If you want to write articles about it, that's cool. If you want us to, that's a different matter, because we don't know the topic. I did actually talk to Ian Saunter about this topic. He thought that it would be nice to have more of a community for those interested in artificial life. 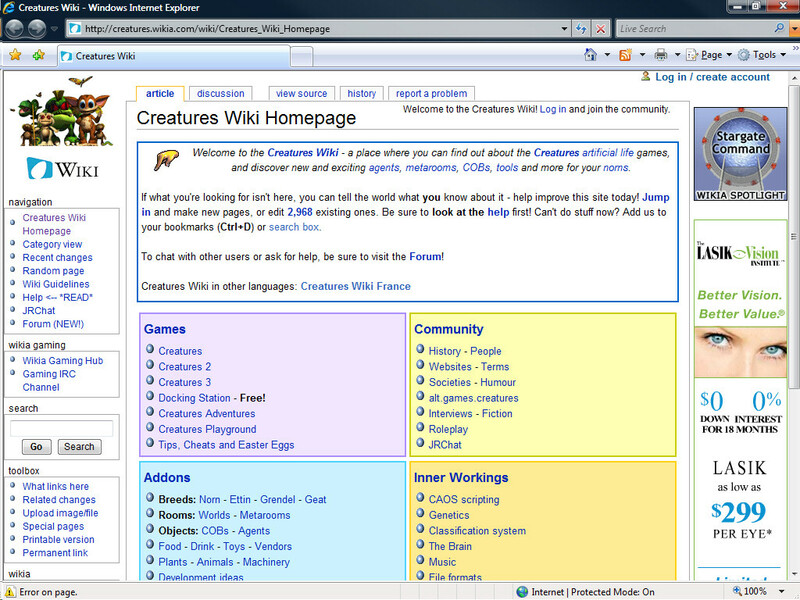 He also said that he wasn't necessarily expecting the Creatures Wiki to fulfil that need. Do you think the spambots are being aimed at this particular URL? I haven't the foggiest how the scripts work, but I know everyone (especially the admins) must be getting tired of reverting the same thing over and over, so I say try and do whatever it takes to keep those nasties at bay! >:o Maybe a soft redirect, like this (inspired by Wikipedia)? This soft redirect exists to keep nasty llama-shavers away. The llama (Lama glama) is a large camelid that originated in North America and then later on moved on to South America. The term llama is sometimes used more broadly, to indicate any of the four closely related animals that make up the South American branch of the family Camelidae: the true llama, the vicuña, alpaca, and guanaco. They were used as a system of transportation for the Incas. More about the llama, courtesy of the Llama Wiki. Would it be acceptable to add the following footer to the Main Page? Hullo! 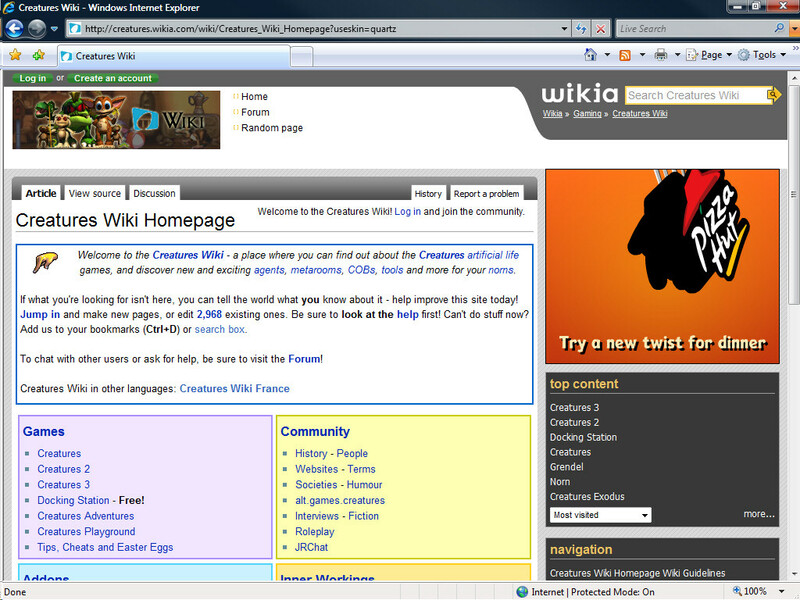 I am Kirkburn, your friendly local Wikia Gaming Helper! 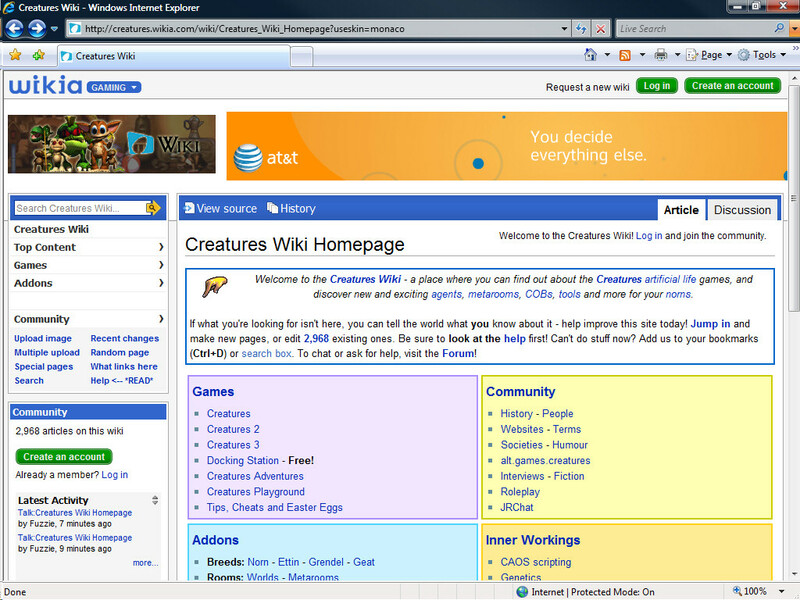 You may be interested to know there is a Wikia gaming IRC channel, #wikia-gaming on chat.freenode.net, where you can hop on, ask for help from users of other gaming wikis, or offer your own experiences. If you are not familiar with IRC clients, you can access it from . We are switching over all the default skins (for anon users) to our new skin "Monaco" this week. 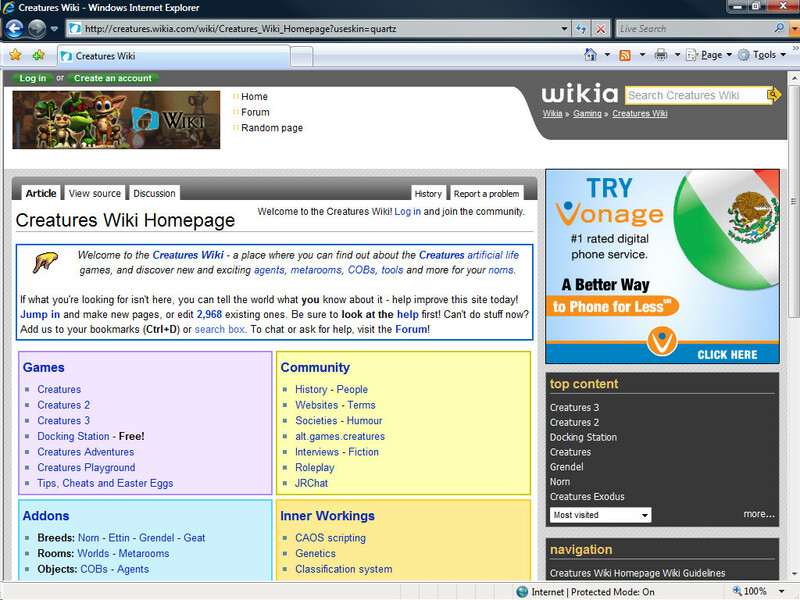 Most of the big wikis have already switched (i.e WoWWiki, Wookieepedia Dofus and FFXIclopedia. 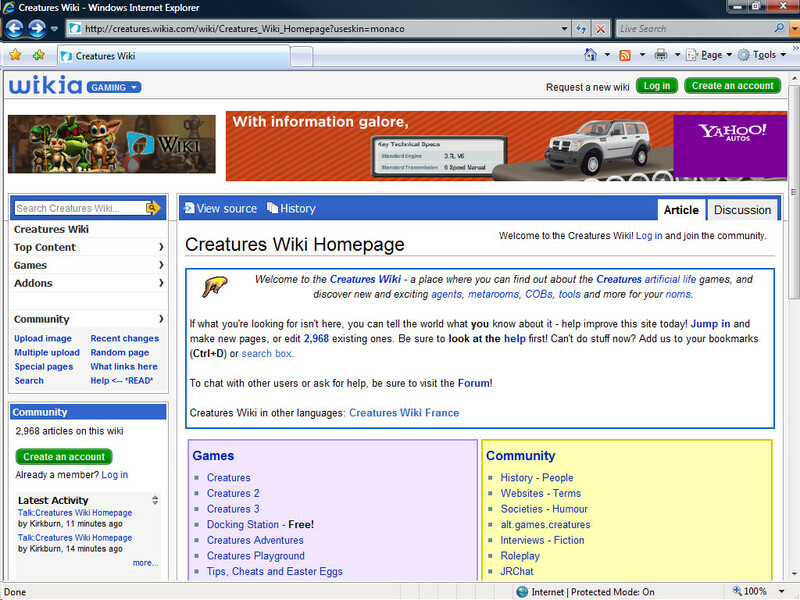 It is now the main actively developed Wikia platform. As a successor to Quartz, it comes with even more customizability - you can find out more on w:c:inside:Monaco Skin Customization, where you can also find out info about the new features and widgets available. The team has taken the liberty of already creating your MediaWiki:Monaco-sidebar, but you can customize it much further with more links. An admin can set the default site skin via the skin section on Special:Preferences, or by editing MediaWiki:AdminSkin. If users wish to see another skin than the default, they can untick "See custom wiki skins (recommended)" on the same page. This page was last modified on 1 April 2017, at 14:09.